The Ndieh celebration is the Thanksgiving Ceremony in Bakossiland. The Bakossi believe that the dead are not exclusively dead; they play the mediator between the Living and God. In the summer of every year, a particular day is designated for the people to commune with the ancestors. Each village decides their celebration date. The chosen date is announced by no else but Sango Muankum, the cultural Policeman, the governor, the judge, the overseer, the landlord, the god of the land, to say the least. He will give tall orders to the entire community to have the whole road network cleaned, and sanctions all the women to stock food at home and reserve their best harvest for the august occasion. The voice of Sango Muankum is louder than an amplifier and it is as petrifying as it is obligate and compelling and not without metastasis. His speed is supersonic, and he can travel through the whole Bakossiland in a split second. As a kid, I used to imagine from his loud and vigorous voice how gigantic and frightful he can look. However, I was thrown at a loss, and kept wondering whether he is human or spirit, but I have reason to believe he is a spirit. His metallic rules are hardly breached, and his fines are hefty as well. He is arguably the most esoteric and mysterious of Bakossi jujus. When he is out there, all lighting’s (lamps and electricity) are abruptly shot down without contest because he works and walks better in darkness and light is said to impair his sight and vision and he levies very lofty fines to defaulters. He never comes out during full moon. If he does, he limits himself to the opaque and sinister shrine, the same holds if he decides to come out during the day, which however is rare except there’s something very ominous and emergent. You can only see him if you are initiated in his world, and the fee is no sinecure, and paying the fee is no guarantee that you will see him. If you are stubborn and head strong, you can hunt him for nine days and nights during initiation before you can behold his tail. Initiation into this judicial juju society is synonymous to a military academy. Whenever I think of him and his activities, not only does my heart skip some beats, but I also sweat profusely. This is one of the highest ingenuities in Bakossiland that I know of. The Litany of the Ancestors is the highlight of this Feted Thanksgiving. This libation is a kind of cultural prayer channeled through the ancestors to the Almighty God. The Bakossi believe that the dead are not really dead. When we commute to commune, we palpate the ancestors, we feel their presence, and we table our turmoil, our pain, our cravings and all to them. Can he ever be a loser? Assembly noooooooooo! This is how a good community should look like! Do you associate a Bakossi man with greed? Assembly am I lying? Nooooooooo! 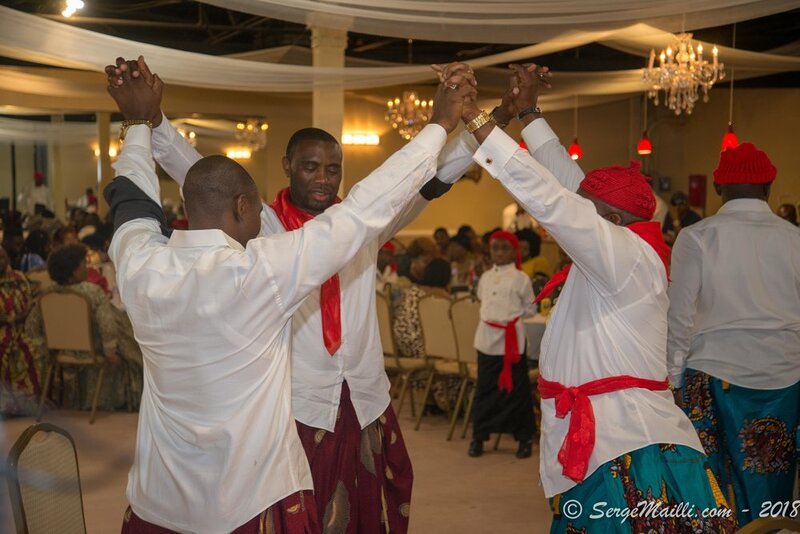 The Ndieh celebration holds an important slot in Bakossi folklore. In those days, when a given year was famine stricken, during the Ndieh, the ancestors were evoked, palpated besought, pleaded with and the following year there was abundance. Kids who could not pass exams, when they were given the Head Mimbo, the ensuing semester, they passed their exam in flying colors. Women who had child bearing problems, when they brought a blessed plantain from the Ndieh, kept it under the bed, roasted it after three days, ate it with palm oil and stepped into the bed with their husbands, miracles happened. Businessmen whose businesses were deteriorating, when they got ancestral blessing, business started booming. Bad omen, mishaps, misfortunes were washed away to the hinterlands and the evil pond (Ndip’eyuk). At home every village decides when to hold the Ndieh; however, it is very often than not during the month of November or December for every village. Every village has a shrine which is contoured by special giant trees with three entrances, the significance of which are still obscure and wrangling to me. 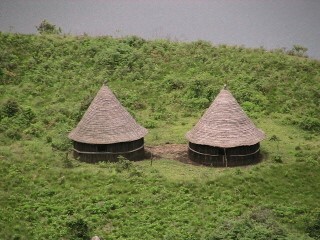 In the middle of the shrine is a specialty hut built of a thatch roof and fern sticks walls from the Muanenguba forest. The interior of the hut is clad with the bark of special trees laced with special grass and thatches. This hut also has three doors as well and the custodian of the hut enters the cabin going backwards. The reason for this demeanor is mysterious and I will not afford to bore you with the particulars. In Washington DC, initially we matched our Ndieh calendar with the home calendar every November. However, November seems to be cold enough to be annoying especially for the kids at the heart of winter. So, we moved it to October for suitability and comfort reasons. We pleaded with the ancestors for this amendment. The custom requires the grandees of the community to meet at the shrine in the evening following the Thanksgiving Day to perform specialty rituals. The best farm harvests, palm wine, kola nuts, the most delicious cuisine and special plantains are brought into the shrine for ancestral blessing. During this Ritual, a skillful cultural orator evokes the ancestors, pleads with them and presents our wants and cravings such as education, jobs, wealth, marriages, births, happiness, and peace. All these pleas are sighed in a series of odd numbers. This is graced with a concatenation of cultural poetic lyrics. We queue to and from the shrine singing praises to the gods of the land. The rest of the evening is spent wining and dining, and discord has no room during this time of the year as this could derail the ancestors. The following day, all the community roads lead to the shrine. 6. After the libation, there is an interlude of cultural lyrics and Mbwen. During this ritual of Mbwen, every participant recounts his appellations, retraces his achievements, setbacks and unusual occurrence in his life to grace the occasion. This is usually spontaneous and spur of the moment. The kola nut talks in Ekoose. When a man stands up to throw the kola nut, he needs to have not only a level head but also a clean mind and coherent talk. If you want to throw the kola nut without reconciling thought and physique, this imbalance throws you out of the loop. You have to put yourself together, to say the least. The kola nut has four and sometimes five pieces. For it to say yes, one of the four or five pieces will face to a different direction and the other four or five will face towards the same direction which is either up or down. Do not take the kola nut cheaply in Ekoose, it is a mind reader. Those who throw the kola nut are chosen from each clan, village of quarter depending on the magnitude of the occasion and representation. If you speak incoherently before throwing the cola nut, the cola nut will be incoherent. Head Mimbo is blessed wine on which libation was done; it is given to those who chose to drink it for ancestral blessing laced with a piece of kola nut that said yes to our ancestral request. In the distant past, kids who failed exams, when they got the head mimbo, the ensuing semester, they just went right through. Women who had child bearing trouble, when they were given the head mimbo, and a plantain from the Ndieh, put this plantain under the bed for three days, roasted it and ate with palm oil. When they stepped into the bed with their husbands, miracles happened. Nsooooooooooo! Businessmen whose business were dwindling, when they were given the head mimbo, business started booming. Nsooooooooooo! After the Head Mimbo ritual, everyone takes a blessed plantain home, keeps it under the bed and roasts it after three days and eat with palm oil for ancestral blessing. There is some controversy that exists between some religious believers and traditionalists. Very often than not, believers look at Ndieh as demonic, profane and sacrilegious. However, before the arrival of the missionaries on the African coast, Africans believed in a Supreme Being, and they worshiped this Supreme Being in various ways depending on the milieu. The Bakossi worshiped God through the Ndieh before colonialism. America is a very religious and pious country, but they do have a memorial day. On this day they visit the tombs of their Dead Ones for whom they had too much love and evoke their souvenirs. The Memorial Day has a common bond with Ndieh, but the church is politely ignoring these fine details and erroneously gives culture a blasphemous and impious label.